As he unveiled his long-awaited health care agenda Wednesday afternoon, Lt. Gov. 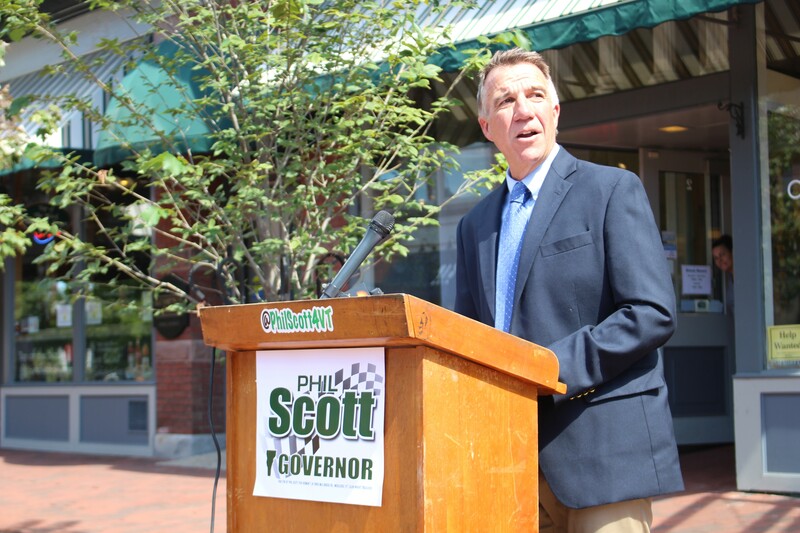 Phil Scott made clear what he thinks of Vermont Health Connect, the state's federally mandated insurance exchange. "Once the foundation is broken, I'm not sure that you get it back," he told reporters at an outdoor press conference on Burlington's Church Street. "We need to do something different." What that "something" would entail, Scott didn't seem to know. Asked repeatedly what he would put in place of the state-based exchange, the Republican gubernatorial nominee demurred, saying he continued to investigate his options. "Well, we're still obviously waiting for the results of the study that was enacted by the legislature," he said, referring to a $250,000 independent assessment that's due to lawmakers in December. "They might come up with something as an alternative model to go towards." Scott has long argued that Vermont should consider moving to a multistate marketplace or the federal exchange, but he said Wednesday that he still did not know which he preferred — and does not "have the resources" to develop an alternative. Asked whether he owed it to voters to explain more before Election Day, he said, "Well, I'm saying we're not going to continue the way we've been going." Though Scott said he was waiting for the results of the independent assessment, he would not commit to following its recommendations. Asked whether he would stick with Vermont Health Connect if the study showed it to be the most cost-effective option, the Republican nominee said he would not. "We've been hearing that for three years now. I think we've been hearing that we're right on the verge of making this work," he said. "There have been a number of dates that have been missed over the last few years, and it's still dysfunctional." Scott left plenty of other questions unanswered. He wouldn't say how much he was willing to spend in order to replace Vermont Health Connect. And he wouldn't say how he would provide state subsidies to low- and middle-income Vermonters if he moved to a federal exchange. "Well, again, those are the details," he said. He wouldn't even say whether he was committed to providing such subsidies. "Well, I think we should weigh that out," he said. Scott wasn't any more forthcoming about whether he supported Gov. Peter Shumlin's proposal to pursue an all-payer waiver. "I don't think any of us fully understand it — and trying to get the details has been difficult," he said, adding that he was "willing to ... look at anything objectively." The lieutenant governor said he was committed to reducing Medicaid's administrative costs, but he would not definitively say whether he would raise the program's eligibility requirements. "Well, I think everything's on the table, but I'm not seeking to do that at this point in time," he said. As for whether the state should make primary care available to all its residents? "I think it sounds expensive," Scott said, arguing that the state had experimented enough with such reforms. "So I'm cautious of anything of that nature." Scott did answer one question Wednesday: whether he thought the creation of a new health care regulatory body — a signature accomplishment of the Shumlin administration — had been "positive." "I think the Green Mountain Care Board has done a lot of good work to control the cost of hospital care," he said. "So I'm hopeful that we can continue with some of that good work." The Republican nominee may not have been prepared to address all those topics. Just 18 minutes into his press conference — after Scott had answered just eight minutes of questions from reporters — his spokesman, Ethan Latour, attempted to end the event. After reporters complained, Scott continued answering questions for another 10 minutes. "In the future when you hold press conferences," one reporter asked Scott, "can you commit to giving us at least half an hour to ask questions — since you're running for governor?"